Considerable barriers can emerge in developing and implementing climate change adaptation strategies. Understanding the nature of barriers to adaptation is important so as to find strategic ways of dealing with them. However, our current understanding is limited and highly fragmented across the academic community. This paper aims to bring some conceptual convergence in these debates by applying a systematic review method to assess the current state of knowledge on barriers to adaptation in the peer-reviewed literature. The review results show that: (1) Barriers to adaptation have hardly been defined in the literature and no clear indicators exist so as to identify and assess them systematically. (2) An impressive number of barriers have been reported, but the list of possible barriers is seemingly endless. (3) The most frequently reported barriers relate to the institutional and social dimensions of adaptation. (4) Barriers are identified as configurations of climate and non-climate factors and conditions that emerge from the actor, the governance system, or the system of concern. (5) Barriers are mainly studied in developed countries with a strong focus on water-related domains. (6) The majority of studies on barriers use small-n inductive case approaches while comparative studies across different contexts are limited. (7) Although interventions to overcome barriers are recommended by most studies, empirical studies on interventions are scarce. We present further conceptual clarification and a more precise definition of barriers to adaptation. We conclude that future research should go beyond asking the questions ‘if’ and ‘which’ barriers to adaptation exist and begin asking ‘how’ and ‘why’ barriers emerge. The online version of this article (doi: 10.1007/s10113-013-0421-y) contains supplementary material, which is available to authorized users. 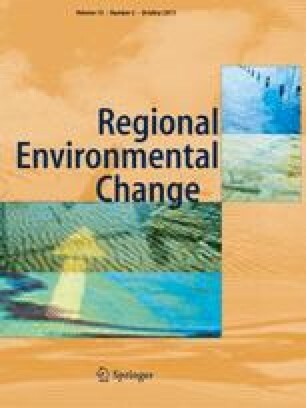 This work is supported by the Dutch national ‘Climate changes Spatial Planning’ research programme and the Strategic Knowledge Development Programme of Wageningen UR on Climate Change (Kennisbasis 2 thema Klimaatverandering). We would like to thank Alexandra Lesnikowski and the two anonymous reviewers for their helpful comments and suggestions. The views expressed in this article are those of the authors.